A large double furnished room is available in house. You will have your own room yourself. A quiet superb location only a 5 -10 minute stroll to West Ryde station, library, shopping centre. 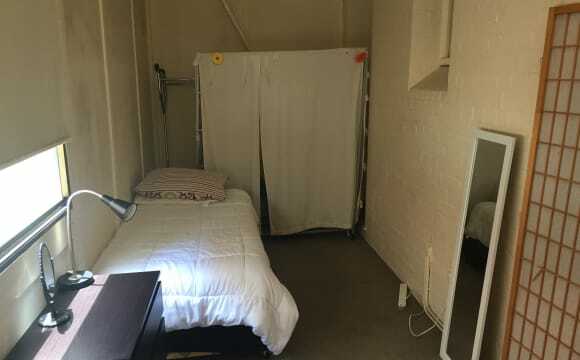 Public transport at door with buses easily access to City, Macquarie University &amp; Parramatta The rent is $195 per week (include water, internet and basic electricity use). If you are interested, please let us know and we can arrange a time that is convenient for you to see the room. This is a 2 Bedroom unit is located in West Ryde - Private room fully furnished with your own bathroom. - Located in front of Anzac park; good for morning walks or exercise . 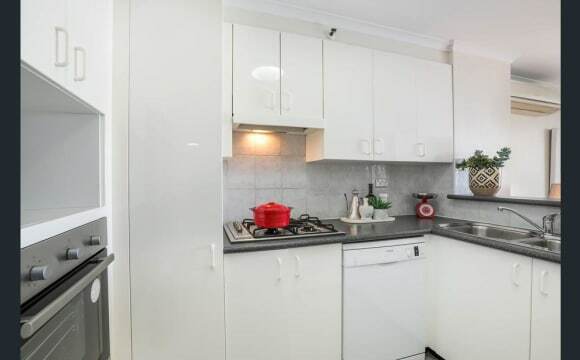 - 2 mins walk to West Ryde station and bus stop. - 2 mins walk to local cafes, hairdresser, butcher, convenience stores. - 2 mins to the local club; Ryde-Eastwood Leagues Club which contains a cafe, restaurants and a gym with swimming pool. - 5 mins walk to 7-eleven and Officeworks. - 8 mins walk to Woolworths, Coles, Bottleshop, dentist, chemist, hairdresser, medical centre, bakery, newsagency, flight centre, Commonwealth bank and various restaurants. - 10 mins walk to F45 and Anytime Fitness. 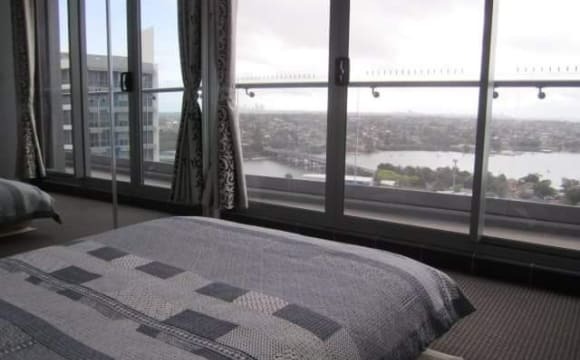 - Very convenient to go to the city with direct train, easy to go Eastwood, Epping etc. The rent includes all bills (electricity, water, gas and internet). Preferably looking for a young working professional who is clean, tidy, quiet, non-smoker and who is able to help with the cleaning of common areas such as kitchen. No couples. Feel free to contact me if you have any questions. This tidy and clean 2 bedroom home is in a leafy area of West Ryde, about a 7 minute walk to the train station and a bus stop that is seconds away. The kitchen is newly renovated with lots of space and there is an internal laundry with washing machine. The bathroom has a free standing shower as well as a bath. The entire home is set up apart from the room that is being put up for rent. There is an uncovered car spot that would be yours at the back of the building. 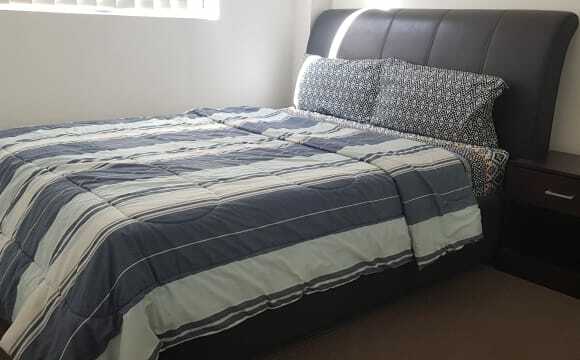 Very large modern fully furnished bedroom in an apartment 300m from West Ryde Station &amp; shops. Near Top Ryde Shops. 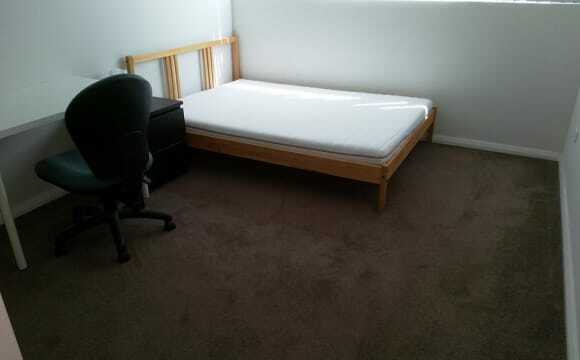 Bedroom is very large, with built in wardrobe, bed, TV &amp; chest of draws provided. Bedroom has a private balcony, air conditioning, and a large modern bathroom (just renovated, whole bathroom is brand new). WiFi through apartment, Foxtel in lounge room, Netflix on TV in room, all bills including internet included in rent. Apartment is fully furnished including all kitchen appliances. There are 3 small playful friendly dogs also sharing the apartment. Undercover parking available. My partner &amp; I work full time, and travel a lot in time off. We are sociable, enjoy a night out, or a BBQ and drinks (though rarely entertain guests at home). We usually cook our own food but are happy to share meals occasionally. We would like a fun sociable room mate. Happy to hang out together sometimes or do their own thing. We have had many nights out with past flatmates don't mind a flatmate occasionally having friends over for BBQs or drinks, but please be mindful if we need sleep with work, as we would be mindful of you needing sleep. We usually clean the common area, but happy to share that duty. There is also a sofa bed if your friends need a place to crash after a night out. Apartment is a 20 min train ride to CBD, and has 24hr bus services to the city. Own room with built in robe, own bathroom and own living area. Pet friendly with huge back yard. Three year old modern, clean, tiled villa with fully ducted reverse cycle air conditioning. Convenient location. Bedroom fully furnished with large built-in wardrobe. You have sole use of the main bathroom with a shower &amp; bath. Meadowbank Train Station is a 15 minute walk/2 minute drive. West Ryde Train Station is a 20 minute walk/5 minute drive. Bus 524 at door going to West Ryde Train Station and Parramatta Station. Shops at Meadowbank and West Ryde. Bus to Western Sydney University. 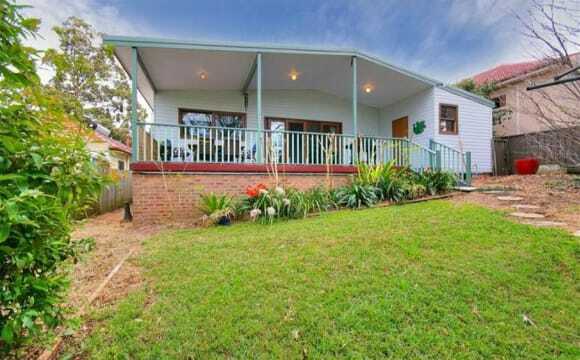 Close to Meadowbank TAFE, ferry, parks, playing fields and Parramatta River. Gas/Elect/Water and Foxtel included. Fully furnished bedroom and kitchen. You don’t need to bring a thing. Lovely quiet neighbourhood. Safe and quite street, friendly flatmates, close to bus stop, shops, supermarkets. On street car parks. The property is a brand new one in Bowden Street. It is around few minutes walking distance from Meadowbank station and there is a bus station right in front of the apartment. Your room will have direct access to balcony from where you can enjoy views of construction 😜 and can see part of the river. The apartment is also within walking distance of meadowbank ferry and parks. There is a gym and IGA store and chemist shop just opposite of the building. Please note that pictures don’t show but I have all the furnitures needed including TV, Bed, Couch, refrigerator and other things to lead Everyday life. You will have your own bathroom, but unfortunately it is not ensuite. Free Netflix, but utilities will be shared. Is a medium sized four bedroom house. You will be sharing a bathroom with the other flatmate as well as having your own lounge, but can always use the main lounge too. Kitchen is a shared space. There is another laundry / bathroom that I use. The house has a large deck, bbq and garden with a lot of veges that you are free to help yourself to. 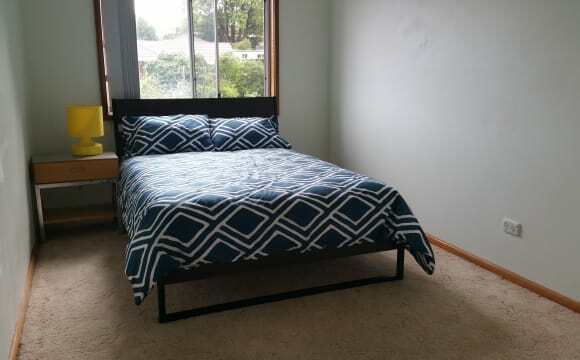 Bright and clean room for a SINGLE PERSON or COUPLE available NOW - - - - - - $210 per week, Unfurnished or $230 per week furnished, for a SINGLE PERSON (includes wifi internet, electricity and water) - - - - - - $245 per week, Unfurnished or $265 per week furnished, for a COUPLE (includes wifi internet, electricity and water) - - - - - VIEWINGS Please call me to arrange a viewing. I would prefer to show you the room in the mornings from 8 am to 10 am or late afternoons from 4.00 pm to 7.30 pm on weekdays, and any reasonable time on the weekends. . THE LOCATION - street parking in quiet road - near shops - near buses and trains - near Meadowbank TAFE - 15 mins bus to Macquarie University - 25 mins train to Central Station . THE ROOM Large sunny room 3.3m x 3.2m Plus built in Wardrobe 2.2m x 0.45m . THE HOUSE Large clean newly renovated kitchen with a dishwasher and lounge/dining room. 2 bathrooms Your bedroom has a large built in wardrobe. The back garden and garage are under redevelopment at the moment. . WE ARE LOOKING FOR SOMEONE - who is animal friendly as there is one medium sized dog and several chickens (but we don't want any more animals) - who will do about 1.5 hours per week of general house duties - who is quiet, clean and responsible - who is intending to stay for a medium or long term (i.e. at least 6 months) - who is able to move in sometime soon (from NOW to end of April) . 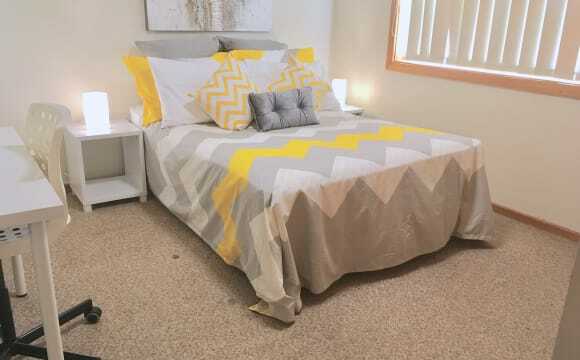 RENT AND DEPOSIT 3 weeks deposit and 1 week rent is required in advance. . If you're looking for a place close to Meadowbank and Ryde TAFE, and also easy access to Sydney CBD, Parramatta, Chatswood and Macquarie, look no further! 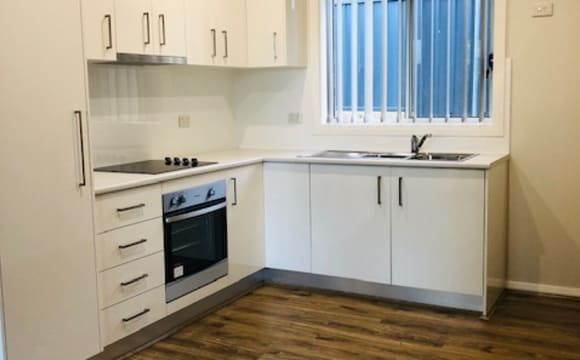 A large, studio sized room with ensuite is now available, located an easy stroll from Top Ryde, the ferry wharf and train stations; with bus access to City just seconds away. Shared living areas of kitchen and laundry, but private ensuite shower and toilet. Furnished. Lockable room with keys for privacy. Brightly lit natural light with good airflow and ventilation. Shared facilities include kitchen and living area. Washing machine, stove, oven, microwave and fridge provided. Responsible, quiet and tidy female students / working professionals are welcomed. Perfect environment for studying and living. Long term rental preferred. 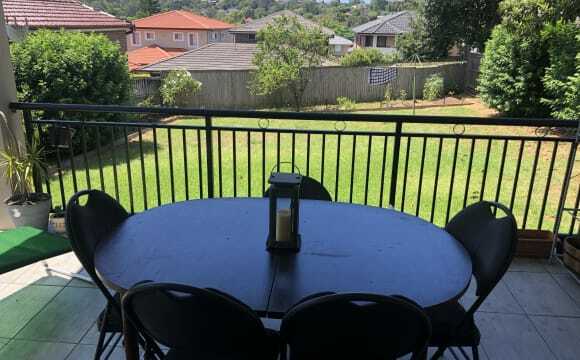 This property is within walking distance to Denistone East Train Station, and only a short walk to bus stop which goes to Eastwood, Top Ryde, City and Macquarie Shopping Mall. If you own a car, there are plenty of off-street parking available, and it only takes minutes to get to above-mentioned places. Note: Garden landscaping is not fully completed yet. Spacious,quiet 4 bedroom duplex with garden and terace in a very nice area. Close to Parramatta, Concord Hospital, TAFE Meadowbank, Sydney Olympic Park and WSU. We also have a house gym which you would be welcome to use. We do have a friendly dog. The house is newly renovated and spacious with polished wooden floors, air-conditioning and high ceilings. It is large and fully furnished with a front and back porch, security at the door and a large backyard. It is close to transport and less than 7mins walk to Top Ryde City Shopping Centre. The room itself is private, with polished floors, a large built-in wardrobe and a large window (with security screen and lock). 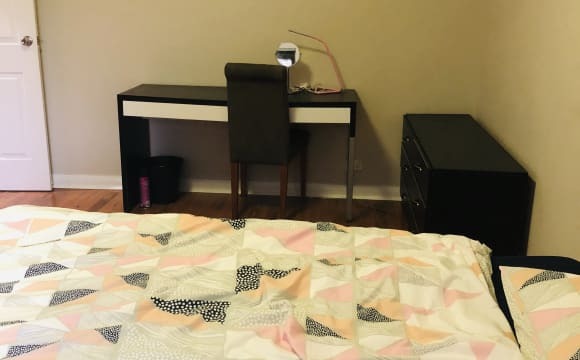 It comes furnished with a bed, bedside table and desk. The price for the room covers the rent and unlimited fast NBN Optus internet. Other bills are hard to predict so we split them evenly. Its a beautiful big house with a stunning garden. It's located in a very quiet neighbourhood and easy to have access to public transport and Top Ryde shopping centre. Huge modern sixth-floor pent house apartment in Ryde. The living room is a spacious open plan area with central heating and the balcony is the largest balcony you will ever see, quite literally built for entertaining over 100 guests and with a truly stunning view of the surrounding area, specifically the water and sprawling landscape. The house itself is relatively soundproof with minimal noise entering and exiting due to being the top floor apartment. We would expect the new house members to join the lease which is coming up shortly. Bus to the city right outside the property, 5 min walk from the water and 10 min walk from meadowbank train station, wharf and Top Ryde Shopping Centre. There is a female only gym in the building if you would like to keep fit. River side view. Please be advised that this is not a share room, however couples are welcomed. More than a spacious and private Ensuite room! Almost a self-contained unit. 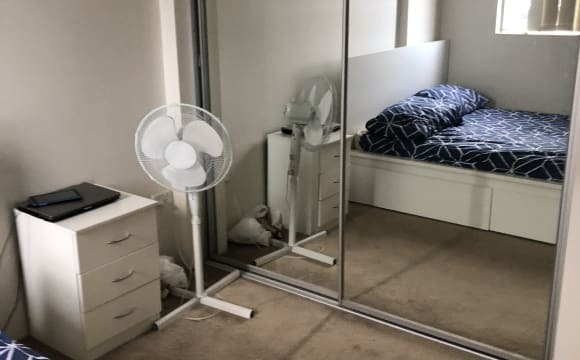 A private/large/bright room in a family home near Eastwood station is for rent. This downstairs ensuite bedroom is self-contained and separated from the rest of the house with its own entry. It has its own bathroom, washer, and a small living room and kitchen. The bedroom is spacious (~13sqm), furnished with a king single bed, bedside table, study desk, tallboy and built-in-wardrobe. The home is 10-15 min walk to Eastwood station, 5min walk to bus-stops to Macquarie University or top Ryde/City. Rent includes all bills (Normal usage) and unlimited broadband. A quiet professional or student is preferred. Only for a single person. Long-term is welcomed.